This Special Edition Box Set contains Books 1 & 2 and an extended excerpt of book 3. 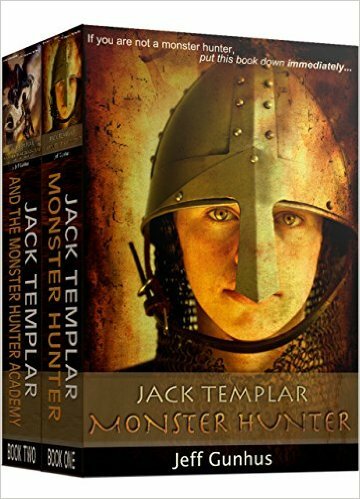 JACK TEMPLAR MONSTER HUNTER: The day before his fourteenth birthday, Jack’s life as a regular kid surviving Sunnyvale Middle School changes forever when he discovers he comes from a long line of monster hunters. Not only that, but if the monsters of the world could kill any single human, he would be on the top of their list. With the help of his friends Will and T-Rex, Jack must join forces with a mysterious monster hunter named Eva and escape Sunnyvale before Ren Lucre himself, the Lord of the Creach, finds him. Jack Templar might be a monster hunter…but he’s also the hunted. 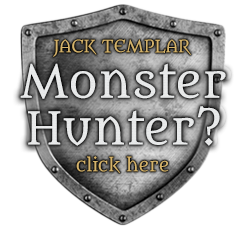 JACK TEMPLAR AND THE MONSTER HUNTER ACADEMY: Jack, Will, T-Rex and Eva embark on an incredible journey across the Atlantic to join the Monster Hunter Academy. Pursued by the Creach at every turn, the gang battles their way to a secret mountain hideout where young monster hunters are trained for a lifetime fighting monsters. Master Aquinas, the ancient teacher who leads the Academy, assures Jack that she will answer the questions he has about his parents and about the prophecy that surrounds him, but only if he first trains to become a full hunter. Jack does train, but it’s not too long before Ren Lucre finds their hideout and Jack is put to the test. Their only hope of survival is for Jack to complete a quest in the Caves of Trial and recover the Templar Ring. At stake is not just Jack’s life, but the lives of his friends and the hundreds of young hunters at the Academy…and quite possibly the world.